George Graham reviews Matt Ellis' "Rambler Pacifico"
Since Bob Dylan went electric more than 50 years ago, there has been a stream of rock singer-songwriters who have brought the lyrical sensibilities of folkies, and sometimes their social commentary into an electric setting, from Bruce Springsteen to more contemporary artists like Jason Isbell, This week, we have another very good example. It’s Matt Ellis, whose new sixth album, is called Rambler Pacifico. Matt Ellis is an Australian native who has been based in Los Angeles since 2005. His previous recordings have attracted international attention, receiving airplay in the US, France, the UK and his home country, in the widespread Americana scene, and has toured internationally. His last album, The Greatest Escape was released in 2014. Matt Ellis’ new album grew in a more organic way than his previous ones. Ellis had set up a home studio in his garage, and started working with his drummer Fernando Sanchez, laying down song fragments and riffs. In the publicity material for the new album, Ellis writes that he did not have any completed songs or lyrics going into the recording process, but was collaborating with musical guests and the songs gradually fleshed out. Since he was now in his own studio and those of friends, there was not the pressure of deadlines and the studio clock running. But despite the seemingly less organized production process, or perhaps because of it, the it’s an album that has a lot of focus musically and especially lyrically. There are several songs with lyrics commenting on the state of the world, like the old folkies, and they all have something to say. There are few, if any songs that could be considered old-fashioned love songs, but there was one that arose from the birth of his baby daughter, with his wife contributing to the vocals. To ground the album in the folk world, there is a cover of the Pete Seeger folk-music anthem If I had a Hammer, done in the rock setting of this album. The musical context is in the classic electric roots-rock-Americana vein, though the personnel and instrumentation varies from track to track, with some added musical spice like horns on a couple of tunes and strings on a pair of other pieces. 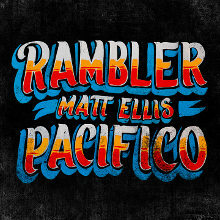 Rambler Pacifico the new sixth release by Australian Americana singer-songwriter Matt Ellis is in the kind of classic electric singer-songwriter mode, but the album has a lot going for it – articulate lyrics and tasteful rock backing. The songs tend to be observations about state of the world in the folk-song tradition, and Ellis’ somewhat weathered-sounding voice is just right for the material. The numerous backing musicians who were brought in, gradually layering their parts to the production from the basic tracks, still end up sounding like a coherent band. Our grade for audio audio quality is an A-Minus. Like the other facets of the album, the sound is competent, workmanlike and honest. The usual points are deducted for the volume compression that undermines the dynamics of the performance in an effort for maximum loudness. It’s not hard to find electric singer-songwriters on the scene these days, even in a music world dominated by computer-processed pretentious pop. But Matt Ellis draws on the decades of folk-rock tradition to come up with a thoroughly worthwhile and standout album.